Resident, Department of Radiology, Saint Barnabas Medical Center, Livingston, N.J. Patients are generally older than 50, with long-standing respiratory disease. Progressive nonproductive cough and dyspnea; smoking may contribute to pathogenesis of IPF. Median survival: two to four years; poorer prognosis compared with other interstitial lung diseases (eg, nonspecific interstitial pneumonia, respiratory bronchiolitis-associated interstitial lung disease, desquamative interstitial pneumonia). Important to exclude potential underlying causes of pulmonary fibrosis (eg, asbestos exposure, drugs, connective tissue disorders). Does not respond to high-dose steroids; might even be contraindicated. 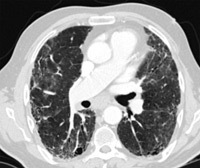 Early diagnosis warrants consideration for lung transplantation. Mueller-Mang C, Grosse C, Schmid K, Stiebellehner L, Bankier AA. 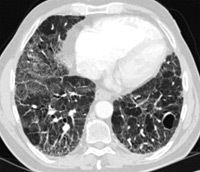 What every radiologist should know about idiopathic interstitial pneumonias. Radiographics. 2007;27(3):595-615.